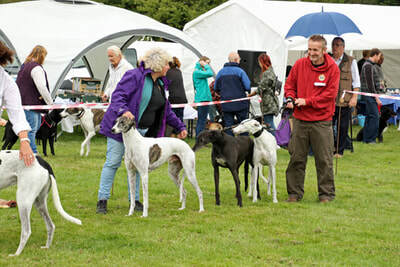 This year’s show was not as busy as the last couple of years have been, but we found out afterwards that there were another couple of dog shows quite nearby. The weather could also have been kinder - but this is England! A bit disappointing in terms of numbers but, as we were lucky enough to secure some excellent sponsorship beforehand, we weren’t down on the amount raised. We ended up with a grand total of just over £4000 after all expenses were paid. 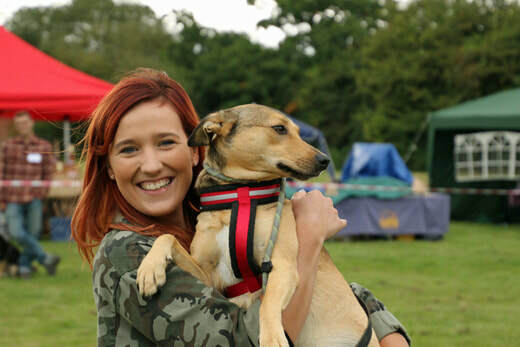 We are so grateful to PROCESS CHAIN, XPO LOGISTICS and BUTCHERS PETFOODS for their support again this year. Their involvement with the Gala really does make a huge difference and we are lucky to have their backing. I am also grateful to our owners and supporters for their individual sponsorship. 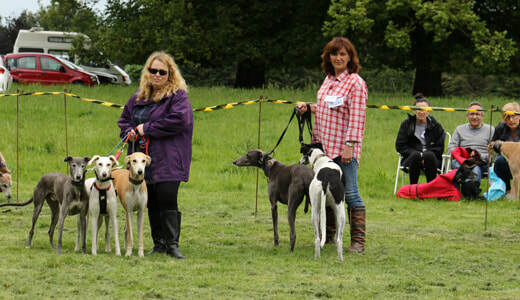 Our judges were Marion Bye and Kerrie Picolo and they made sure that all of the classes ran like clockwork. For larger versions of these photos, simply click on a pic! I owe a huge thank you to all of our volunteers who worked so hard over the weekend and to those who helped with all of the pre-show preparations. 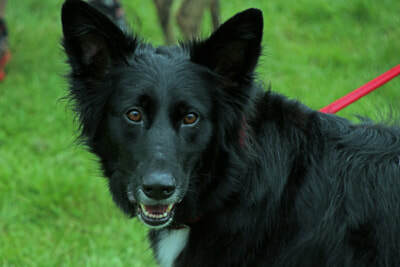 Several of the kennel dogs came up at lunchtime for our usual parade and we have homed two of them as a direct result of the show. All in all, the event was a success and we hope to see many of you on 2nd September 2018. Get that date in your diary! Our show at Courteenhall this year was a huge success. 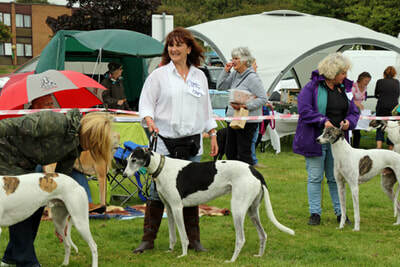 After last year’s show was almost abandoned because of the horrendous rain, this year the sun shone for a good part of the day and we coped with the odd little shower. 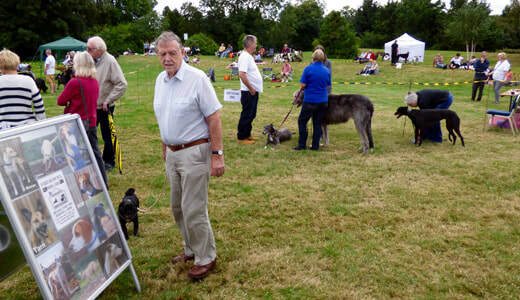 We had a really good turnout and as always, loads of our wonderful dogs came along to say hello and take part. Our two judges Sam Lee and Marion Bye were both kept busy with good sized classes and we are grateful to them both for all their hard work. 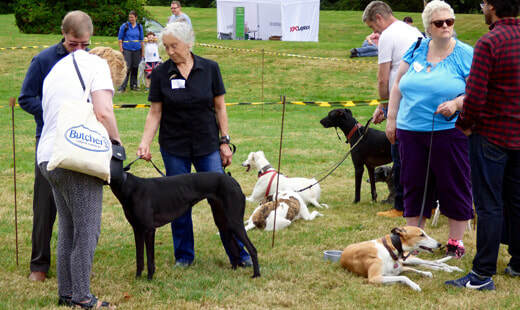 I am indebted to all of the NGR and Homes For Hounds volunteers who worked their socks off on both Saturday and Sunday to make sure everything went smoothly. Our very sincere thanks to the Wake family for letting us use their beautiful parkland once again this year. It was our 12th visit and we hope they will let us continue to come along for the foreseeable future. Show venues really are important and we feel that this one couldn’t possibly be bettered. 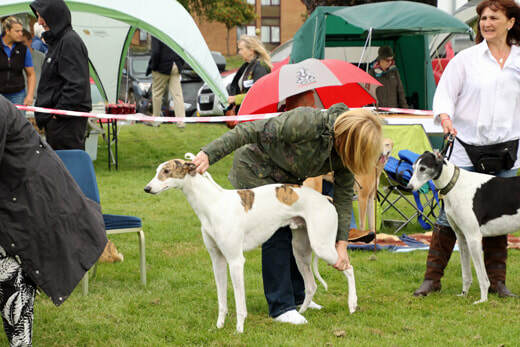 Thanks to the support of our loyal owners and friends, we raised just over £1400 - a new record for this event. Thanks to everyone who came along and supported our recent Quiz Night. It was a huge success - our quizzes are proving very popular and seem to be an enjoyable evening out for all! I am grateful to Chris and Debbie, Allen, Donna, Anne for all their hard work and to Howe’s Fish & Chips for their incredibly efficient feeding of 100 people in such a short space of time! Definitely the best fish and chips in the area. We raised £630 for the dogs in our care - a brilliant amount! Thank you to everyone involved. Our usual weekend has always been the first Sunday of September but due to a big wedding at The Holiday Inn, we had to change things to the week before. 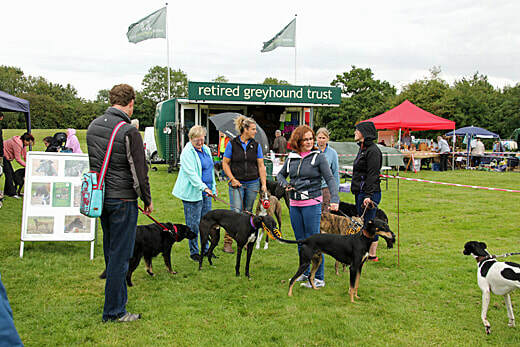 This was a Bank Holiday and people tend to go away then - I was concerned that visitors to the event would not be around and maybe some of our volunteers would also not be available. The weather the previous week had been awful and, given that our Courteenhall Show had almost been rained off, we needed to have a successful Gala. Setting up on the Saturday was the stuff of nightmares. We got the tents up in the morning, which was great, but in the afternoon the heavens opened. 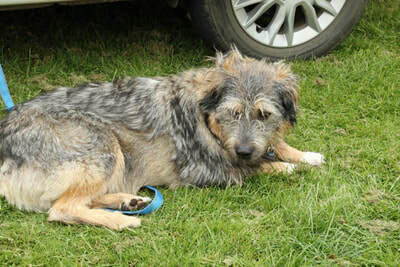 We had rain, gale force winds, thunder and lightning - oh joy!! We had bought a new tent and this proved worse than useless - rain poured straight through it and everything we had set out quickly became soaked. I found myself hurtling to Argos (five minutes before they closed!) to buy a couple of gazebos! When we got to Crick on Sunday morning it was awful - although the weather was dry, we had a marquee to take down, shift loads of stuff, and then put up two more tents and organise their contents. Chris and Debbie’s tents had blown down and was almost wrecked - I could have screamed! Finally, we managed to get organised and I am SO grateful to my dear friends who all turned up so early to help get things ship-shape - you were all stars! The weather stayed fine, other than one shower, and as usual, things went very well once the show got started. Yes, the crowds were down but it could have been far, far worse. Our owners and supporters turned out in force, as always, and everyone really seemed to enjoy the day. Our stands were busy and I think everyone was happy with the end result. Our show sponsors made a huge contribution to the financial success of the event - Process Chain were so very generous once again and we owe them so much for their support over the years. XPO Logistics and Butchers Pet Foods also contributed this year and we hope that they will be happy to help again in the future. So many of our owners sponsored the show classes, trophies and rosettes - you are all very kind and we never take your generosity for granted. The Gala could never take place without this sponsorship - thank you one and all. We held our annual Christmas Fair together with the Auction and Craft Fair on 26th November at Bugbrooke Community Centre. 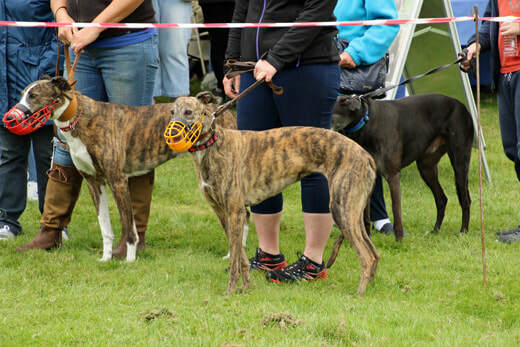 Our thanks to all who came along to support us on the day and for those who made bids on line for the auction items. Thanks also to all the helpers on the day and especially to those who very generously gave items for the auction. I am grateful to Jo and Sam, our hardworking judges and to their stewards - they seemed to enjoy the day as much as we did. We had some gorgeous dogs on show and loads of lovely comments about the kennel dogs who had come up for the parade. They were all very well behaved but the star was little Romanian girl, Dana - she went around the ring as if she had been doing it all her life. We were concerned about how she would handle things, but our fears all proved groundless. She thoroughly enjoyed herself. 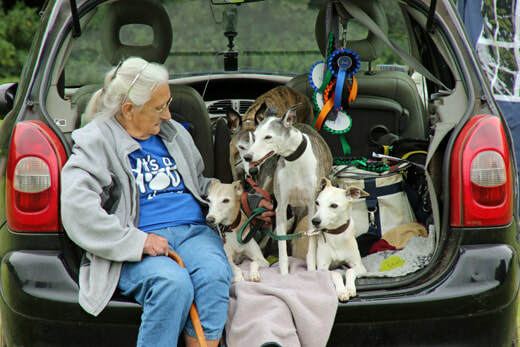 A huge thank you to all the NGR and Homes For Hounds volunteers - they worked their socks off all over the weekend and I am so very grateful to them all. My particular thanks to Allen, Chris, Debbie and Donna who did so much to help prepare for the show. I would also like to say thank you to Karen and Shonny who came to the kennels on Bank Holiday Monday and helped unload and put away all the tents and other equipment. It was very much appreciated. We raised the brilliant total of just on £4,000 - down on last year, but as I said, it really could have been far, far worse. People were very generous and definitely put their hands in their pockets to support our dogs - I cannot thank you all enough. Hopefully, we will be back to our normal date next year and minus the stormy weather!